1. The President of the Russian Federation, H.E. 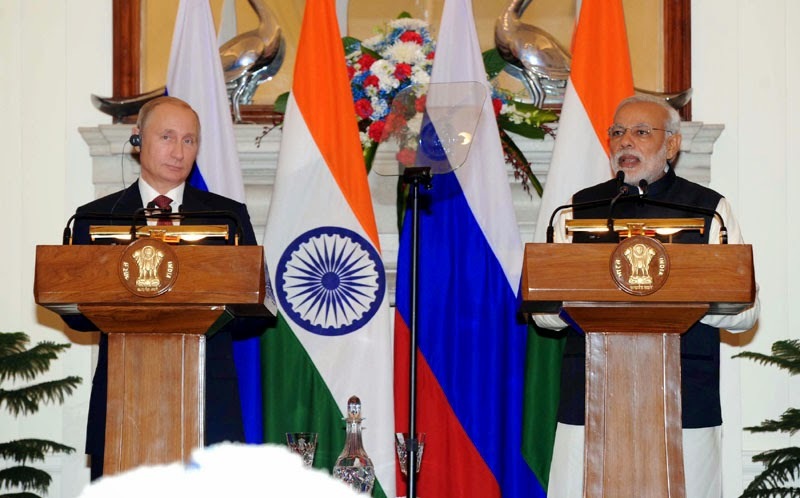 Mr. Vladimir V. Putin, paid an official visit to India on December 11, 2014 at the invitation of the Prime Minister of the Republic of India, H.E. Mr. Narendra Modi, for the 15th Annual Summit between the two countries. During the Summit, the leaders agreed on a vision for strengthening the India-Russia partnership over the next decade. Recognizing that the special and privileged strategic partnership between India and Russia has been built on the strong foundation of mutual trust, bilateral understanding and unique people-to-people affinities, the leaders emphasized that the time has come for a significant broad-basing of bilateral cooperation to carry the friendship between the countries to a qualitatively new level. 2. India deeply values the monumental contributions made by Russia to India’s developmental and defence needs in the second half of the twentieth century. The Declaration on Strategic Partnership of 2000 and the Annual Summits it initiated, have allowed the two countries to redefine and strengthen their partnership in the twenty-first century. 3. The leaders expressed confidence that a strong bilateral strategic partnership advances the national interests of the two countries and contributes to a more stable and secure world order. The two countries have resolved to strengthen this partnership over the next decade through concrete initiatives in diverse areas and to make the bilateral institutional dialogue architecture more result-oriented and forward-looking. While both leaders will continue to meet on the margins of multilateral events, the Annual Summits will review and supervise the progress in the realization of this vision for India-Russian partnership. 4. Acknowledging natural complementarities in the area of energy and India`s quest for energy security, the sides will expand manifold bilateral cooperation in the field of energy, including oil and gas, electric power production, nuclear energy, renewable energy sources, and energy efficiency. 5. The bilateral program ‘on enhanced cooperation in oil and gas sphere’ underlines the serious commitments of the two sides to develop cooperation in this area of great promise. The leaders envisage broader collaboration between hydrocarbon companies of the two countries in oil and gas exploration and production as well as in LNG projects and supplies. The sides will promote natural gas utilization as an abundant and environmentally friendly source of energy for diverse purposes in their economies, including motor fuel and feedstock. It is expected that Indian companies will strongly participate in projects related to new oil and gas fields in the territory of the Russian Federation. The sides will study the possibilities of building a hydrocarbon pipeline system, connecting the Russian Federation with India. They will also examine avenues for participation in petrochemical projects in each other`s country and in third countries. The leaders have encouraged Indian and Russian companies to pursue greater participation in each other`s power generation projects, as also in supply of equipment, technology for enhanced oil recoveries and extraction of coal, including coking coal. 6. The two countries view nuclear energy as a clean, reliable and viable source of energy. They have a joint vision for cooperation in nuclear energy, aimed at serial construction of nuclear power units, based on Russian design, as also on and existing and possible future bilateral agreements. India and Russia will expand their cooperation in science and technology, industry, localization of equipment and spares, uranium mining, fabrication and supply of nuclear fuel, management of spent fuel and in other aspects of the nuclear fuel cycle. Towards this objective, the Indian side agreed to expeditiously identify a second site, in addition to Kudankulam, for the construction of the Russian-designed nuclear power units in India. 7. India and Russia will work together to further strengthen regional multilateral cooperation in the field of energy. In this context, the sides recognize that the first Asia-Pacific Energy Forum (APEF), held in the city of Vladivostok in May 2013, has laid the foundation for an enhanced regional energy dialogue under the auspices of the UN Economic and Social Commission for Asia and the Pacific (UNESCAP). They will be guided by the provisions of the ‘APEF Ministerial Declaration’ and ‘Plan of Action on Regional Cooperation for Enhanced Energy Security and the Sustainable Use of Energy in Asia’, endorsed by UNESCAP Resolution 70/9. 8. The energy efficiency agencies of the sides will engage more closely to exchange experiences and best practices. India and Russia will also cooperate in the development and efficient use of renewable energy. 9. Noting the synergies between national efforts by the two countries to develop a knowledge-economy powered by technology and innovation, India and Russia will increase collaboration in joint design, development, manufacturing and marketing of technology-driven products and scientific interaction between the two countries. In particular, such cooperation will extend to space applications, defence technologies, aviation, new materials, communications and information technology. 10. The two leaders see limitless opportunities for bilateral cooperation in outer space to advance societal applications and scientific knowledge. The space agencies of India and Russia will engage more actively on space technology applications, space transportation, satellite navigation, space science and planetary exploration. In 2015, the two countries will commemorate the 40 years of the launch of Indian satellite `Aryabhata` using Soyuz launch vehicle. By the time of the 50th anniversary of the launch, the leaders would expect significant collaboration between India and Russia on peaceful uses of outer space. 11. Defence cooperation between India and Russia is founded on deep mutual trust and promotes wider peace and security. The two countries have already moved to a phase of joint design and development of defence systems. The sides recognize the virtually unlimited opportunities for enhancing this cooperation, increasingly based on joint research and development, joint manufacturing, technology sharing and collaborative research in futuristic technologies, in accordance with existing agreements on military-technical cooperation. To this end, India has permitted foreign direct investment in the defence sector up to 49 per cent. The sides will exploit these opportunities optimally and enrich bilateral interaction through regular joint military exercises, training in each other`s services institutions and institutionalized consultations between the armed forces. 12. The sides will intensify bilateral scientific and technological interaction to increasingly focus on innovative, high-technology sectors and their commercial applications. They will further develop various support mechanisms for joint research. Their bilateral scientific and technological collaboration will cover frontier areas, such as environmental science, power sector (including alternative sources of energy), energy efficiency and energy security, information and communication technologies, nanotechnology and new materials, engineer science, bio-energy, nano-biotechnology, bio-equipment and affordable diagnosing equipment for healthcare and agriculture. It will be aimed at creating institutional linkages between scientific research institutions of the two countries. In view of the importance of safeguarding food security, the sides would expect to conduct further joint research in the fields of horticulture and biotechnology. They will exchange scientific and technological manpower to build capacity for exchange of knowledge most relevant to the economies of the two countries. Further academic exchanges will also be promoted through schemes for visits by scientists that will enhance human resource capacity building in the science and technology sector. An action plan on this subject will be prepared. 13. India and Russia recognize the importance of the Arctic and the contributions in promoting cooperative activities to address Arctic issues by the Arctic Council, given that Russia is a member and India has joined as an observer in May 2013. The sides agreed to facilitate scientific cooperation to study the challenges (like melting ice, climate change, marine life and biodiversity), facing the rapidly-changing Arctic region. 14. Given the strategic importance of rare earth minerals and their economic and commercial utility, the sides will enhance cooperation in rare earth minerals’ mining, technology development and research. They will explore joint development of technologies for processing rare earth materials. 15. The sides will promote bilateral economic, trade and investment cooperation to contribute to the enhanced role of emerging markets in the world economy and to foster sustainable, balanced and inclusive global growth. 16. The two leaders recognized the enormous untapped potential in bilateral trade, investment and economic cooperation. The two governments will intensify efforts to identify measures to facilitate the full realization of this potential. They have encouraged Indian and Russian enterprises to explore more fully new opportunities arising from increasing national focus on infrastructure development and expanding the manufacturing sector. It is expected that Russian companies will utilize the opportunities in a wide range of Indian sectors and will ‘Make in India’. 17. The sides will encourage payments in national currencies for bilateral trade. The Working Group established for this purpose will make recommendations on eliminating the existing barriers and stimulating transactions in national currencies. The leaders agreed that the initiative launched by India and the Eurasian Economic Commission for a Joint Study Group (JSG) to explore the feasibility of a comprehensive economic cooperation agreement covering trade in goods, services, investment cooperation, movement of natural persons and mutual recognition of standards, is of great importance for bilateral economic cooperation. The Russian side will support the productive work of the JSG so that this Group completes its study within an optimal timeframe. The leaders noted that the International North-South Transport Corridor can vastly improve the efficiency of bilateral trade by significantly reducing transit time and freight costs. India and Russia will work together to conclude the necessary multilateral arrangements and outreach to step up the use of this corridor at the earliest. The leaders noted with satisfaction the progress made in promoting direct trade of diamonds between our two countries and particularly in facilitating enhanced diamond trade through diamond exchanges in India. These measures should expand the share of direct diamond exports from Russia to India significantly. 18. India-Russia mutual investment should become a new point of growth in bilateral economic cooperation. There will be constant focus on the agreed plans for bilateral investment cooperation, the sides will take all necessary measures to support successful implementation of such plans. An emphasis will be laid on promoting Russian investments in India in major infrastructure projects like DMIC, Smart Cities and Freight Corridors, as well as in broader sectors like telecom, power and roads. In Russia, Indian participation in Industrial Parks and technology platforms, in sectors like pharmaceuticals, fertilizers, coal and energy will be encouraged. The sides will encourage specialized investment funds to invest in these sectors and in the joint manufacturing of high technology products. In this context, they welcome the initiative of a direct investment fund of US$ 2 billion between Rosnano and suitable Indian investment partners for implementation of high-tech projects. They will protect the legitimate interests of investing companies. In particular, the sides will enter into discussions to renegotiate the existing bilateral agreement for protection and promotion of investments, initially agreed on 23 December 1994, to provide for the protection of foreign investments in each other’s territory. 19. The leaders noted that the governments of the two countries and their industry representatives should join hands to disseminate information about business opportunities in each other’s countries. The sides also agreed on mutual trade facilitation measures, particularly with regards to simplified customs procedures. In this context, they agreed to finalize shortly a protocol on a "Green Corridor” project. The leaders also invited companies of the two countries to realize the substantial opportunities in engineering; pharmaceuticals; information and communication technology; chemicals; fertilizers; metallurgy; agro and animal products; and transport. 20. The sides will promote further strengthening and increasing the effectiveness of our bilateral inter-regional cooperation. They noted with satisfaction that many cities and regions in the two countries have established linkages (Cities: New Delhi-Moscow and St. Petersburg; Bangalore-Novosibirsk; Chandigarh-Ufa; Chennai-Volgograd; Hyderabad-Kazan; Kolkata-Vladivostok and Yaroslavl; Kochi-Pyatigorsk; Mumbai-St. Petersburg; Pune-Yekaterinburg; Panjim-Krasnodar; Thiruvanathapuram-Stavropol; Thrissur-Yessentuki. Regions: Andhra Pradesh-Tatarstan; Gujarat- Astrakhan and Tatarstan; Haryana-Bashkortostan; Karnataka-Irkutsk, Khanty-Mansiysk Autonomous Okrug-Ugra and Samara; Kerala-Irkutsk; Maharashtra-Siberia) for cooperation in various fields. The leaders agreed to encourage linkages between other regions and cities of the two countries with a view to enhance trade and investment, tourism, cultural and people-to-people contacts. The leaders expressed confidence that a web of linkages between these and other regions and cities will bring substantial benefits to these regions and cities and bolster India-Russia partnership further. 21. With these and other initiatives, the leaders agreed to step up efforts for enhancing bilateral trade in the coming years and set a target of bilateral trade turnover of goods and services at US$30 billion by the year 2025. It is expected that the level of mutual investments by then will be over US$15 billion each way. 22. Reaffirming their commitment to upholding the principles of international law and promoting the central role of the UN in international relations, India and Russia will work together to promote a polycentric and democratic world order based on shared interests of all countries. The two countries will work for democratization of global political, economic, financial and social institutions so that these institutions better represent the aspirations and interests of all segments of the international community. India and Russia oppose economic sanctions that do not have the approval of the United Nations Security Council. 23. The sides reaffirmed the need for UN Security Council reform in order to make it more representative and effective in dealing with emerging challenges. They agree that any expansion of the Security Council should reflect contemporary realities. In this context, the sides will work together to ensure reforms of the UN Security Council. Russia will extend its support for India’s candidature for permanent membership of the Council. 24. The two countries will consult and coordinate in multilateral fora such as G20, EAS, BRICS and RIC. Russia looks forward to India becoming a full member of the SCO following the completion of all required negotiations procedures. The sides support the evolution of an open, balanced and inclusive security architecture in the Asia Pacific region based on collective efforts, considering legitimate interests of all states of the region and guided by respect for norms and principles of international law. 25. The leaders condoled the loss of life in senseless terrorist acts in recent days in Jammu & Kashmir, India and in Chechnya, Russia. They believe that the nature and spread of international terrorism in recent years, as demonstrated by developments in their shared neighbourhood, require global resolve and cooperative measures of the international community without double standards or selectivity. The threat to all humanity posed by terrorism justifies a collaborative approach, in accordance with international law and the Charter of the United Nations, putting aside differences and tensions between countries and regions in other political and economic areas. The sides agreed to work together for the adoption of the Comprehensive Convention on International Terrorism by the 70th Anniversary Summit of the UN. The leaders expressed hope that all safe havens and sanctuaries for terrorists will be wiped out without delay and terrorism would be completely eradicated from the common region within a decade. 26. The leaders welcomed the peaceful transition of political authority in Afghanistan and called upon the international community to join efforts to support reconstruction and economic development in that country and to continue capacity building of its national security forces. The sides hope to see an Afghanistan that would within a decade flourish as a prosperous hub for trade, industry and energy. 27. As two states possessing advanced technologies, India and Russia have converging interests in preventing the proliferation of weapons of mass destruction. This is reflected in their participation and positions in international fora such as the Conference on Disarmament, IAEA, Global Initiative to Combat Nuclear Terrorism and stringent national export control measures. The Russian side confirmed its support to India’s intention to seek full membership in the Nuclear Suppliers Group and its readiness to facilitate positive decision of the Group on this matter. Russia also supported India’s interest in full membership in the MTCR and Wassenaar Arrangement. 28. As responsible users of outer space, India and Russia share substantive interests in the long-term sustainability of outer space activities and in maintaining outer space for peaceful purposes. They will work together in the UN Committee on Peaceful Uses of Outer Space in Vienna, the Conference on Disarmament in Geneva, the UNGA First Committee in New York and other fora to advance their shared interests. 29. Information and Communication Technologies (ICTs) are transforming this world and playing a vital role in development. The sides will collaborate to promote safe, secure and sustainable use of ICTs globally, including through the UN. 30. In the backdrop of regional issues and conflicts, the leaders voiced their strong conviction that political dialogue and negotiation should be the sole means of resolution of conflicts, rather than military force. 31. Recognizing the enormous goodwill, respect and strong ties among the peoples of India and Russia, the sides supported enhancing measures by the two governments to promote and support cultural exchanges through annual festivals of culture, exchanges between cultural institutions, think tanks, tourism promotion events and other initiatives. 32. The sides will take steps to strengthen education ties through facilitating and extending support to each other`s students. They supported the establishment of institutional linkages between universities and academic institutions of the two countries. The sides will promote in this context the development of network partnerships between universities. Early conclusion of agreements on mutual recognition of education, qualification and degrees should further encourage leading universities and research institutions of India and Russia to support greater exchanges of student research scholars, post-doctoral candidates and faculties. 33. India and Russia will maintain close contacts and interaction in international sports matters. The sides agreed to deepen interaction and expand the scope of India-Russia cooperation in the field of sports, to support an exchange of practices between sports’ federations, scientific and research institutions, promote physical training and sports and direct contacts between organizations of the two countries. The sides will encourage cooperation to promote health and fitness through traditional Indian forms of Yoga and Ayurveda, including through Yoga centres, camps and Ayurveda centres. 34. The Russian side welcomed the simplified visa regime introduced by the Indian side in November, 2014 under which nationals of Russia will be granted electronic visa on arrival at designated airports in India. Both sides agreed to further ease visa requirements for mutual travels of certain categories of citizens of the two countries, including business visas. This will further enhance people-to-people contacts and boost tourism. 35. The discussions and decisions of the two leaders, as well as the detailed agreements at the bilateral dialogue have given the leaders the confidence that objective political, economic, security and cultural factors will propel India-Russia partnership to a level that meets the aspirations of their people. The relationship between India and Russia has been tested by time and will continue to be a friendship based on complete trust that will bring happiness and prosperity to peoples of both countries.